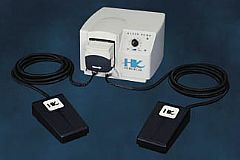 The Klein Pump provides optimum flow rate for procedures requiring tumescent infiltration. Operates on any voltage worldwide. Optical cut off switch with safety Interlock and easy load head. Includes Single Spike Tubing, Double Spike Tubing, Dual Pneumatic Foot Switch, User's manual. Radio-Button mode: Each time the footswitch is depressed the pump goes from on to off, or from off to on. If the pump is initially off, then stepping on the footswitch turns on the pump, and the pump remains on until footswitch is again depressed. Pressure mode: Applying pressure to footswitch turns-on the pump, and removing pressure from footswitch turns-off the pump. Increasing frequency of beeping sound indicates increasing Fluid-Volume flow rate. Power: 24 VDC 1 Amp.